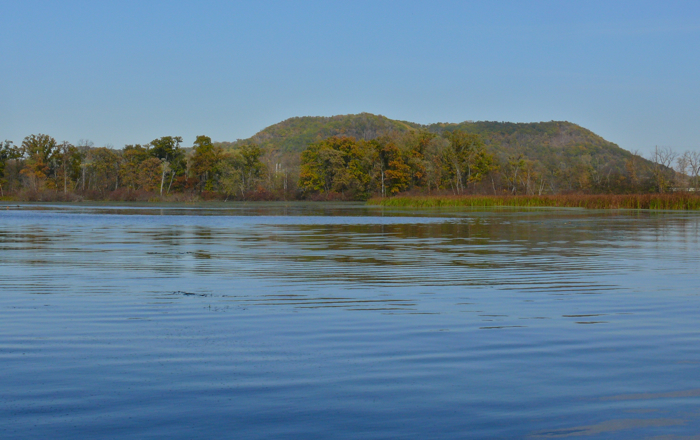 We went on what is probably our last boat ride of the season on the Mississippi.Mike wanted to be sure the motor was working after all his attempts to get fixed. It worked perfectly! 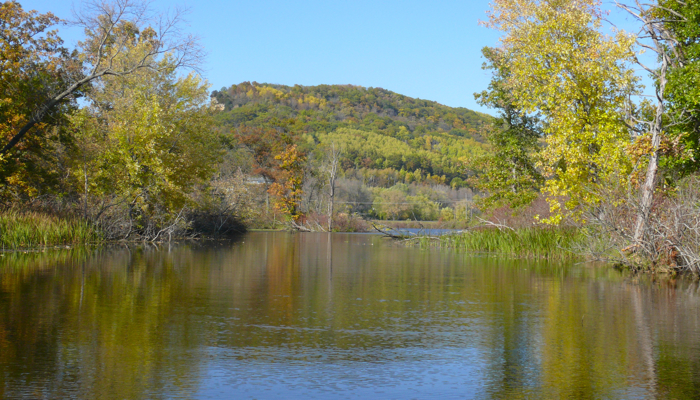 So we checked out the fall colors and watched the ducks fly up whenever we came around a corner. I collected some of the duckweed-like plants floating on the water in the backwaters. 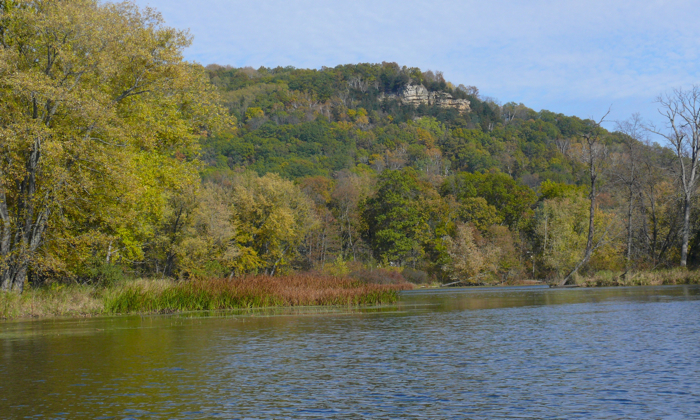 I love these mats of floating vegetation – they’re made up of millions of individual plants. 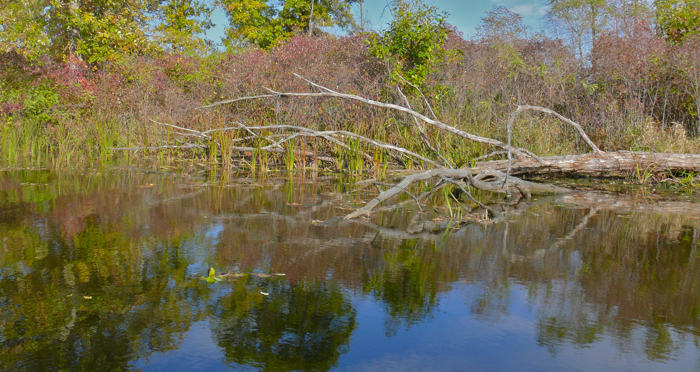 This photo was taken on one of our earlier trips, showing an area of duckweed in one of the quiet backwaters. This is what the mat looks like, close up. It’s actually a mix of several different plants. I collected a handful and found five different species: one fern, and four flowering plants. 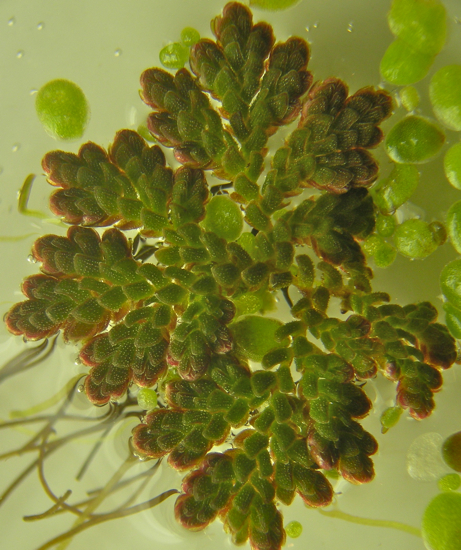 This is the fern: called Floating Fern or Mexican Mosquito-Fern (Azolla mexicana). 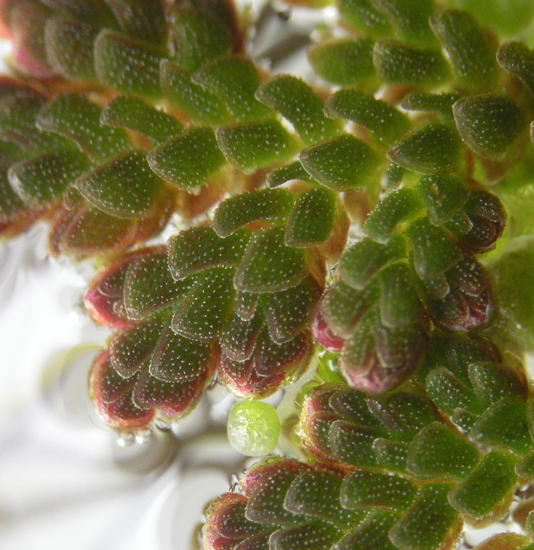 The upper fronds are rounded and green or green and red, the lower ones are translucent and shaped like little boats. They help keep the fern afloat. 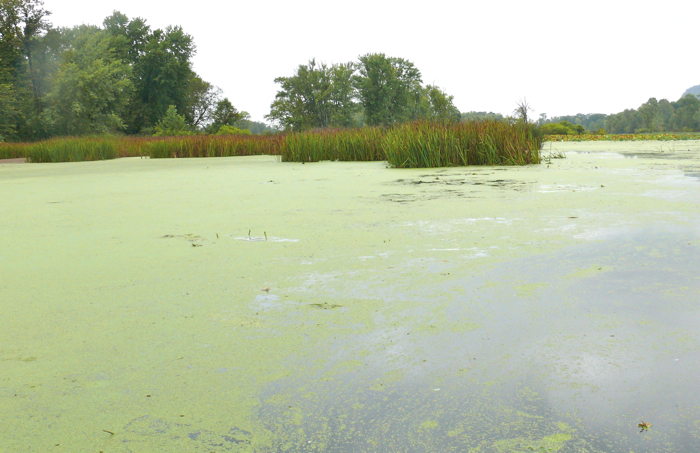 The largest of the flowering plants is called Greater Duckweed (Spirodela polyrrhiza). It has small round fronds – like floating leaves – with numerous roots coming out of the bottom of each one. The upperside of the fronds are green and red, the underside is red. The fronds are about 5 mm across. 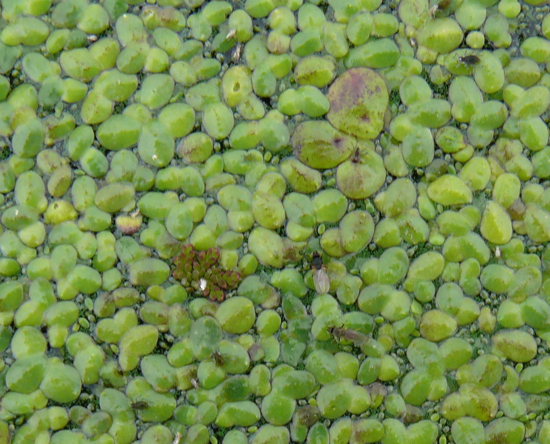 The next smaller plant is Common Duckweed (Lemna minor). 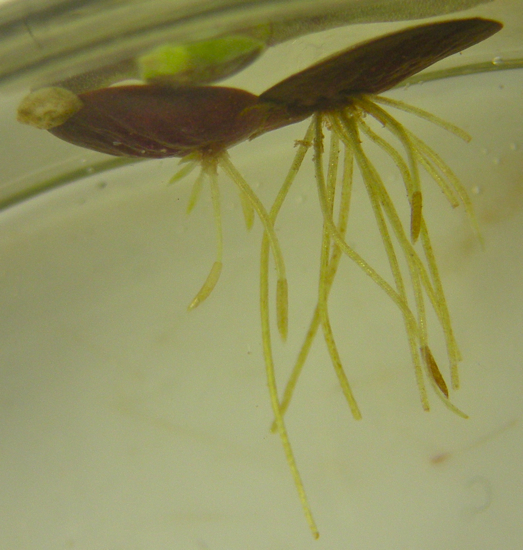 It’s fronds are 2-3 mm across, and it has a single root coming out of each frond. 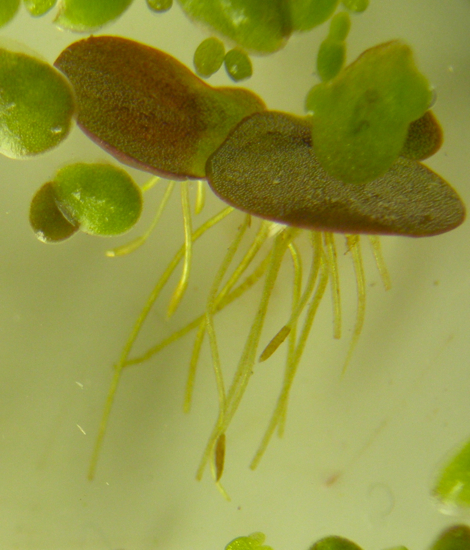 The smallest two plants are in the genus Wolffia – the smallest of all flowering plants. 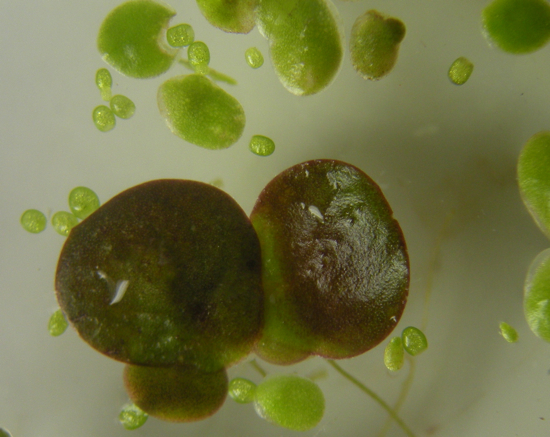 This picture shows both species – with a Common Duckweed plant for comparison. Wolffia plants are between .5 and 1.2 mm long. The rounder, sparkling fronds are Wolffia columbiana, and the longer narrower plant, with two fronds, is (I think) Wolffia borealis. 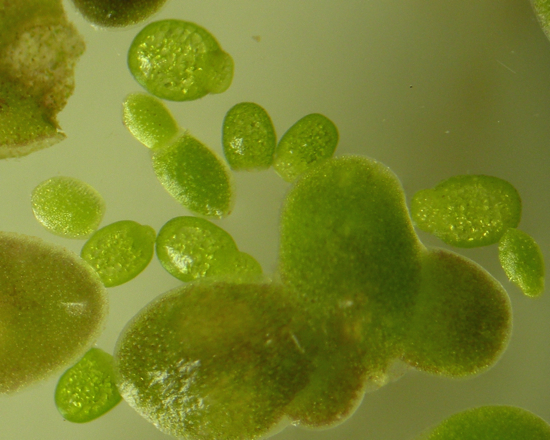 The common name for Wolffia is Water Meal. According to Wikipedia, Watermeal has about the same protein content as soybeans (40%), and is scooped up and used as food in some countries in Asia. It started to get colder and windier so we headed home. 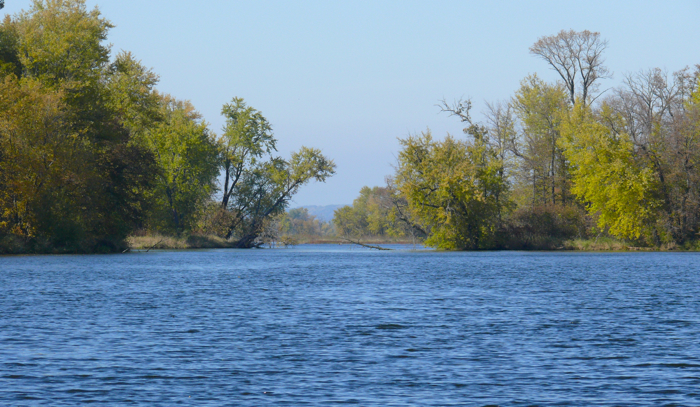 The rest of our explorations will have to wait until warmer weather.